After breakfast (included), continuing eastward, you will pass into the Rocky Mountains today. 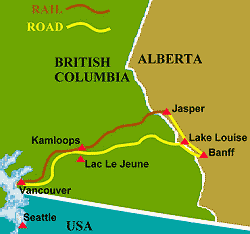 The highway takes you over Rogers Pass, through Glacier and Yoho National Parks, past the Spiral Tunnels, into Banff National Park and by Lake Louise (a short detour from the highway) before you arrive into the town of Banff. Overnight in Banff. Your journey will take you back past Lake Louise today (in case you missed it the first time), and then northbound on the Icefields Parkway to Jasper. Along the way, you will see many glaciers, glacier-fed lakes and spectacular peaks. A stop at the Athabasca Glacier gives you the opportunity to take a ride on one of Brewster’s unique SnoCoaches up onto the glacier (admission included). Overnight in Jasper. Early this morning, drop off your rental car at the train station then board the Rocky Mountaineer for your two day trip to Vancouver. Breakfast and lunch are included onboard today as well as transfers in Kamloops. Overnight in a moderate Kamloops hotel. 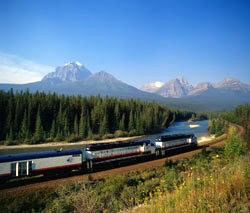 Re-board the Rocky Mountaineer for the second day of your journey to Vancouver. Breakfast and lunch are again included on you trip today. Your tour ends upon arrival into Vancouver.